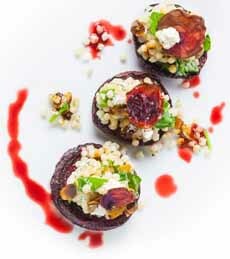  Beet and goat cheese with a twist: garlic couscous (photo courtesy Chef Adrianne). Pearl couscous, also called Israeli couscous (photo courtesy The Fitchen, which uses it in this couscous, spinach and mushroom recipe). 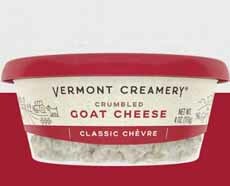 Vermont Creamery’s crumbled goat cheese saves time (photo courtesy Vermont Creamery). Beets and goat cheese are one of our favorite duos. We’re always game for a new recipe. This one, a first course, was sent to us by Chef Adrianne Calvo, a creative Miami restaurateur (photo #1). 2. TAKE the last beet and boil half of it in 1 cup water for 30 minutes, or until the liquid becomes thickened. Take the other half and thinly slice it on a mandolin. Bake the slices for 30 minutes to make beet chips. Set aside to use as garnish. 3. UNWRAP the baked beets and allow them to sit for 45 minutes to 1 hour. In a small sauté pan, add the olive oil over medium heat, and the garlic slivers. Cook stirring often until the garlic begins to brown. Set the pan aside, including the olive oil. 4. SLICE the cooked beets into 1/4-inch-thick slices. In a large bowl, combine the cooked couscous, garlic and olive oil, parsley, goat cheese crumbles and balsamic vinegar. Toss. Top each beet ring with couscous mixture. Garnish with the beet liquid, beet chips and chives. You can purchase a log of fresh goat cheese, but in order for it to crumble you need to leave it in the fridge to dry overnight (be sure your fridge has no ambient aromas). Slice off what you need and put it on a plate. Crumble it with your fingers the next day. If you like the idea of goat cheese crumbles, leave the whole to dry, sliced in chunks. Crumble it and keep it in an airtight container for a week. You can use it on everything from salads, grains and vegetables to eggs, burgers, pasta and pizza. If you don’t want to take the time to cook beets, look for vacuum-packed cooked beets like Love Beets. They won’t have the texture and meatiness of roasted beets, and you won’t find large diameters, but they are tasty in of their own. Love Beets and other brands also offer flavored beets, such as Honey & Ginger and Sweet Chili. *Pearl couscous, called Israeli couscous, is similar to regular couscous: pasta granules made from semolina or whole wheat flour. 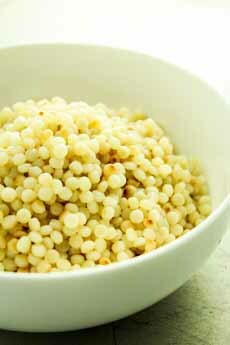 Pearl couscous is larger—the size of pearls—and thus has a slightly chewy texture, similar to barley. The granules are toasted rather than dried, giving it a savory flavor nuance.